I have been sick as a d o double g since Saturday. Avalon got this first and it's just hitting Drew. We got our dang flu shots, but I swear this was the flu. It's settled into my chest, but I'm hoping I'm on the mend now. I have to get back to work! I hate being sick because I get so restless. So, yesterday I worked on the final details of this stocking project. Jewelry Television is presenting these stuffed with gifts to vets at a local VA hospital. I was so pleased to be able to do something to say, "Thank you" to those who have fought for our freedom. I'm also pleased as punch with how this turned out! I have to make one for our mantle now. I used a scanned and sized Victorian era postcard from my ephemera collection (the card had some damage which I fixed in Photoshop) and printed it on a sticky back fabric sheet. I added glittered accents using Ranger Stickles. Aleene's Super Thick Tacky Glue worked like a charm on the rick rack, ribbon, vintage button and repurposed metal elements. 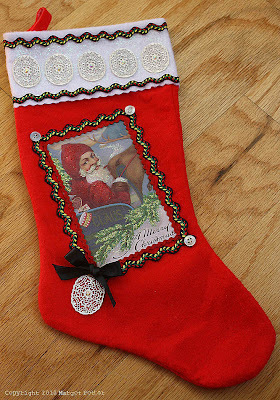 It's amazing what a little creativity can do for a dollar store Christmas stocking! So pretty - love the yellow, red and green ric rac. Feel better! I wouldn't call it "a little" creativity. That's lots of creativity! On the bright side, this may give you immunity so you're safe for the rest of the fun holiday season. What a decorative stocking. I can't believe you started with a dollar store stocking. Great post!